Time-Life continues their release of discs from their big Carol Burnett "Lost Episodes" set in smaller doses with what was disc #19 in that set, titled "Carol + 2: The Original Queens of Comedy," although the only other "queen" present is Lucille Ball; the other in the "+2" title of Carol's CBS special (which actually appears second on this disc) is Zero Mostel. This special aired in March 1966, a bit over a year before "The Carol Burnett Show" became a regular series and gives us a taste of what that show would bring on a weekly basis. 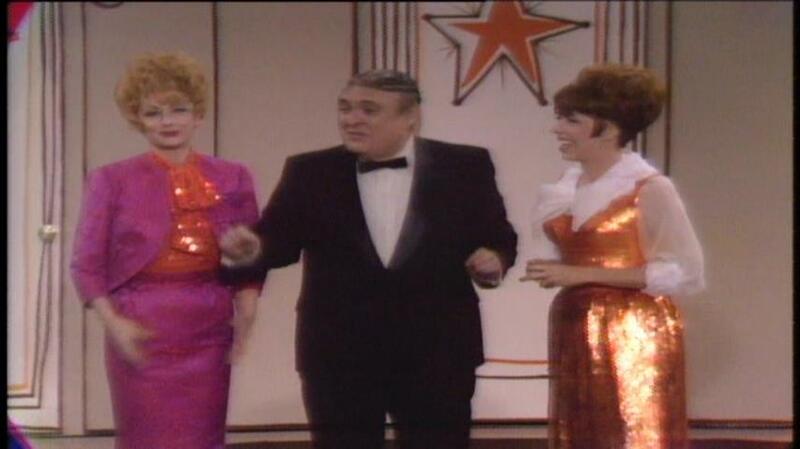 The story behind this special was that CBS would let Carol do a prime-time special every once in a while as long as she could bring another "big name" guest onto it- Lucille Ball had once told her that she just had to call her if she ever needed a favor, and while Carol was still a bit shy to ask her to appear on this show she did and Lucy said yes. Other than the stars themselves, there's not really much "special" about this special other than an excuse to let them take up an hour with some hit-and-miss comedy skits and a few musical numbers. The most notable comedy bits are Carol and Zero playing an unhappily married couple who find out their marriage might not have been legit and then somehow find each other attractive again, and two with Carol and Lucy: One has them as sisters in the city, Carol with a new baby in a carriage. She claims the months-old tot regularly says "goodbye" to anyone who leaves and won't let Lucy catch her bus until he says it- while it's kind of silly, Lucy's presence makes it respectable. Another sketch has them as after-hours maids cleaning up a Hollywood talent agency and knowing more about the business than those they're cleaning up after. Zero Mostel goes solo at the halfway point performing "If I Were a Rich Man" from "Fiddler on the Roof" which had started on Broadway just a couple years prior (it's hard to tell if he's singing live on camera or not, but the musical accompaniment sounds pre-recorded), and the show wraps up when it feels like they've just gotten started. As with several of Time-Life's other TV releases, this was taken from a master that had the original commercials included but they've been edited out for the disc, but not very accurately as we can see the head or tail ends of some of them. 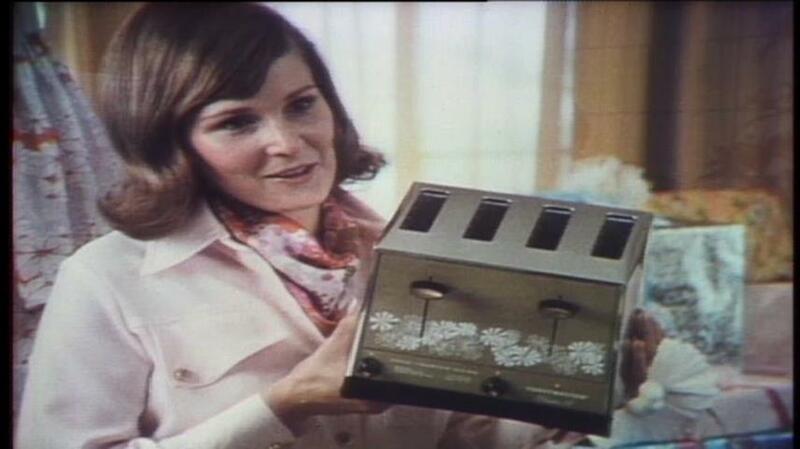 They do leave in Carol's ending plug for American Motors' safety efforts. While "Carol + 2" is supposed to be this disc's main attraction, if you hit the "Play All" option everything will play as one continuous title and the first show you'll see will actually be "Once Upon A Mattress," which first aired on December 12th, 1972 in a 90-minute slot as "The Carol Burnett Show" was already in full swing. This special (which the cover says is a "television movie" but was shot on videotape in front of a live audience as the regular show was) is a musical and comedic take-off of Hans Christian Andersen's "The Princess and the Pea" (one of the few fairy tales that I'm not too familiar with), and was performed earlier on Broadway with Carol in the lead role as she is here. She plays Princess Winifred (going by "Fred" for short), who swims across the castle's moat in order to attract Prince Dauntless who is looking to get married. His mother Queen Aggravain (Jane White) has decreed that he can only marry a real princess, and has tested a number of his previous candidates only to fail them. Her ultimate test, where the story's title comes from, is to have the princess sleep on several mattresses with one pea wedged in between them- if she's a real princess, it'll bother her and she won't be able to sleep. I don't really know the significance of that, but that's how the story has always been. The Queen has also cursed her husband King Sextimus (Jack Gilford) with the inability to speak, allowing her to basically rule the kingdom without his interference- and she's decreed that nobody in the kingdom can get married until Prince Dauntless does. This presents a problem for knight Sir Harry (Ron Husmann) as his beau Lady Larken (Bernadette Peters) has a child on the way which would make them a disgrace if that were found out before they could marry. 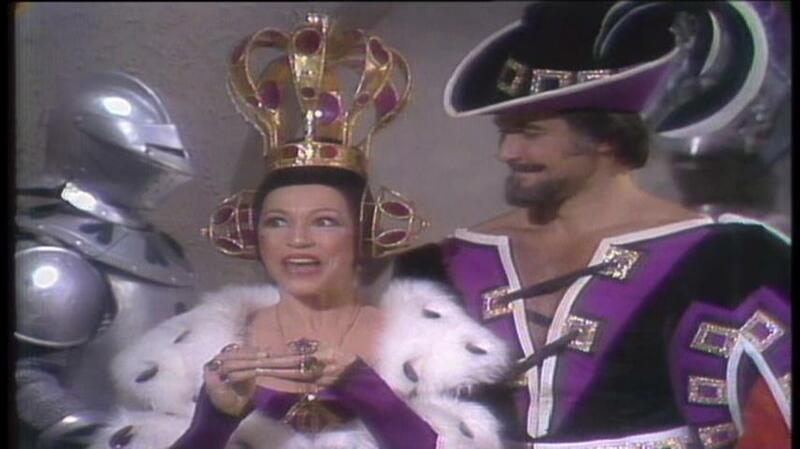 "Carol Burnett Show" regular Lyle Waggoner appears as the knight Sir Studley who platonically conspires with the queen. 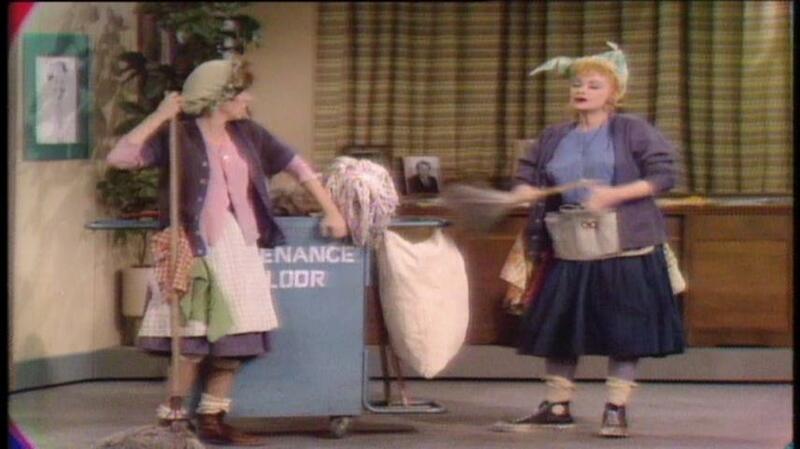 This production would have fit in with Carol's regular show, except that it required a full 90-minute slot. 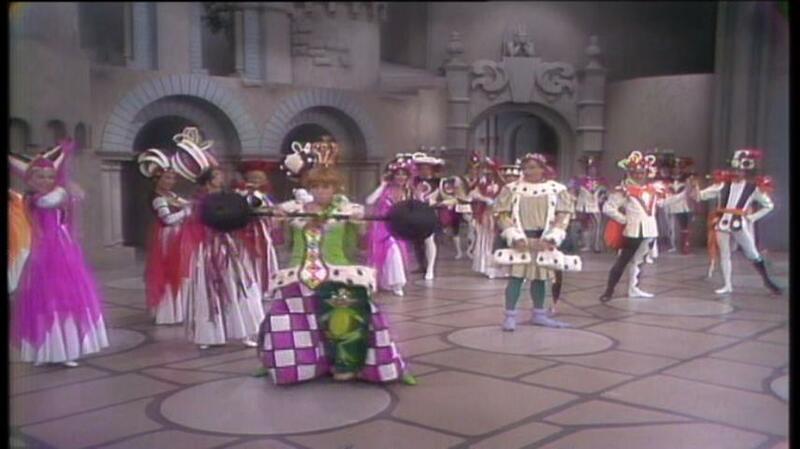 It plays out like the live stage productions done during TV's early years, and has a few lively musical numbers. A huge plus in my book was that the commercials were left in on this disc, although there are no network show promos- those were likely still cut due to clearance issues. I'm a sucker for commercials from any time before the mid-1980s, when I then watched and recorded enough TV to remember the ones from that time on. A few gems show up including Chiffon Margarine's "It's not nice to fool Mother Nature," and some are produced on videotape with analog video effects and graphics that are fun to look at now. (Once commercial for Sure antiperspirant shows a 1973 copyright onscreen, so this may have taken from a master used for a rebroadcast a few months later. The presence of show promos that aired with it would have made it easier to place.) Oddly the minute of black space has been left in two places, roughly at the half-hour and hour marks, when the local affiliates would cut into the network feed with local commercials and station IDs. The disc concludes with a black-and-white clip from a 1963 special titled "Carol and Company," where she appears onscreen as the Charwoman character for the very first time and does a silent routine with music lasting several minutes before launching into song. A recent intro from Carol has her explain her idea for the character when hearing David Rose's instrumental "The Stripper" on the radio, and imagining a cleaning lady tidying up a burlesque house stage after-hours and going into a fantasy performance- of course keeping it wholesome enough for family TV audiences. Again Time-Life includes an onscreen message at the beginning of the disc about "the age of the film elements" producing a less-than-perfect picture, but all material is from videotape. The master tapes look to be in good condition overall with bright colors and not a lot of noise, making it almost feel like you could be watching these shows live. "Once Upon A Mattress" greatly recreates the experience of watching the original broadcast as it includes the commercial breaks, some of which are shown via rather primitive-looking film transfers but that's exactly how they looked on the air. "Carol + 2" appears a bit softer with just a bit of analog "snow" which I can't tell whether is inherent in the tape or cameras used, and the final clip from 1963 also looks practically live aside from being in black and white. Time Life's DVD unfortunately shows a few compression artifacts although they don't appear to be as bad as some of their previous discs. The mono audio is encoded in 2-channel Dolby Digital and remains properly centered. Quality is quite good considering how low a priority sound usually was for television back then; most affiliates in fact received network audio through low-fidelity phone lines so the sound here will be far better than many first heard it. As in the previous "Carol Burnett Show" DVDs, there is a bit of "print-thru" where loud sounds are heard faintly in the background a few seconds before they actually occur, which sort of spoils some moments when Carol yells out loud. Although everything on this disc is played continuously when "Play All" is selected, each show has a newly-shot intro from Carol Burnett where she gives a brief history of what we're about to see. The disc is chaptered rather sparingly with chapters placed only at the beginning of each show's return from commercial break; with the commercials being included in "Once Upon A Mattress" I would have liked to have been able to skip directly to each one as well as to the songs in the show. It's always great to see pristine-quality videotape presentations of rarely-seen TV specials from a time when they were treated as events, and even more so when the era's commercials are left in for posterity. If I ever acquire a working Zenith Chromacolor TV like the one my parents bought in 1972, I'll watch "Once Upon A Mattress" from this disc on it and be fully transported back to then. I'm glad that Time-Life decided to release this disc on its own, rather than keep it as an exclusive only for those able to spring for the large box set all at once.